A publisher is into trouble when his wife mistakes a new female colleague for his secret lover. 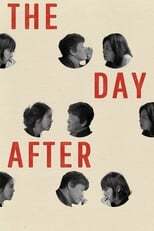 The Day After is directed by Sang-soo Hong and was released on Jul 6th, 2017. Director Sang-soo Hong's Drama & Romance movie The Day After is produced by Jeonwonsa Film & Contents Panda & was released 2017-06-07.